The first time I tasted this, I couldn’t stop saying Oh my gosh! This is so GOOD, this is SOOO good. Everyone laughed at me. Then they scooped out some of this fabulous creamy, buttery, warm and spicy wonder onto a cracker. And could not stop saying Oh wow! This is SOOOOO GOOOOD!!! We all circled around, scooping and savoring and MMMMMing, until 20 minutes later – empty plate. It is so easy to make. Leave the peel on the apples to add color. In fact, you could use a green apple and a red apple for more color. I used Gala, but any crisp cooking apple will work. You can leave the entire rind on the Brie if you like, but that is not our favorite part so I scrape off the top. The side and bottom rinds will form a container for the cheese. Water biscuits are good, but we also like a mild whole grain or nut based cracker to serve with it. Nothing more to say but — this is sooooo good! Unwrap Brie and gently scrape off top rind. Place in 9 inch quiche or pie pan. Wash and core apple and cut into small pieces, about ½ inch cubes. 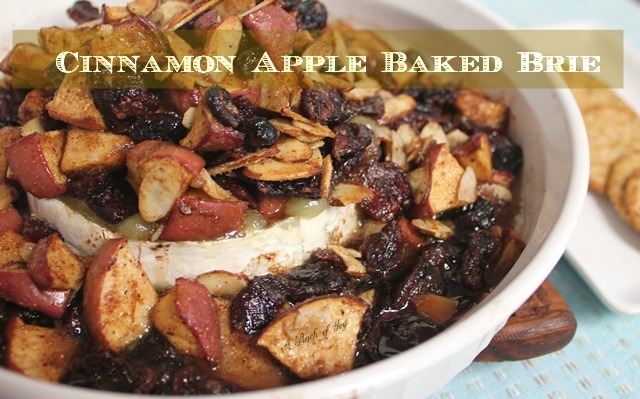 In mixing bowl, combine apples, dried fruit, sugars, spices and slivered almonds. Carefully spoon apple mixture over and then around the Brie. Melt butter in microwave and drizzle over the apple mixture. Bake for 30 minutes or until cheese is soft and bubbly. Serve immediately with mild flavored crisp crackers or water biscuits. I’m so glad you stopped by today! Be sure to follow A Pinch of Joy using the little icons on top of the post so you don’t miss a thing! I’d love to have your company on this venture!! Share: if you found this helpful or inspiring please click one of the buttons below! Your support of A Pinch of Joy is appreciated!